I like making a shopping list of all the ingredients I need to prepare the meals I have planned for the coming week. I like looking through the sales papers trying to find which store has the best prices for the items I need. I like sorting through my (hopefully not expired) coupons. I just love finding a great deal. That being said, I usually find the best value for my money at Aldi. They don’t take coupons but they do have weekly specials. Some people only like to buy brand name items, but personally, I sometimes prefer the store brand. For many items (not all), the ingredient labels are practically the same. You are paying a higher price for all the advertising and marketing for the name brand product. Aldi brand products are usually fine with my family. I have, however, noticed in the last few months, that my local Aldi store (Chicago Suburbs) is now carrying some name brands like Coke and Downy fabric softener. Actually, I don’t particularly care for Aldi brand fabric softener … I’m an April Fresh Downy girl, but I happen to like Aldi diet cola better than Diet Coke. Anyhow, Aldi doesn’t carry everything, so after shopping there, I head over to whichever mainstream grocery store had the best bargains that I found from my perusing of the sale papers. There I get the rest of the items on my list. I used to order from companies like Market Day and Schwann’s, but usually for more specialty or treat like things. 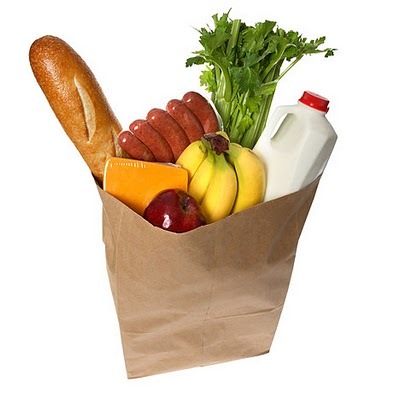 Have you ever used an online delivery service like Peapod for your grocery shopping? The prices seem a little high for this bargain shopper, but I was recently talking with a friend who used this service because it freed up her time to take care of other things in her hectic schedule. Life is so busy these days … everyone has a jam-packed schedule. Even with all our modern conveniences, it seems that there just isn’t enough time to get everything done. People have to decide what they need to personally take care of and what they can delegate to others. Wouldn’t it be great if there were more hours in the day to get everything accomplished?